Championships should be decided by great matches, and there was greatness as Liverpool beat Manchester City 3-2 with a dramatic winner from Philippe Coutinho after an awful mistake from Vincent Kompany leaving Steven Gerrard in tears and a few matches away from winning the title. A story of two halves, or maybe three thirds. Liverpool started like they have against all the big clubs at home – in a blitz, aggressive and dominant. A beautiful pass from Luis Suarez put Raheem Sterling in the box with two defenders and Joe Hart to stop him. Sterling tricked both defenders and was left with an open goal to score in front, giving Liverpool a 1-0 lead after six minutes. An excellent first half from Liverpool continued and after a series of corners got the second goal they deserved from the centre back who produces like a striker, as Martin Skrtel scored his 7th goal of the season. Manchester City, losing Yaya Toure to an injury early on, started looking more and more dangerous, forcing a goal line clearance from Liverpool late in the first half. James Milner came on early instead of Jesus Navas early in the second half, and Manchester City started playing through John Flannagan’s wing, while David Silva put on one of his finest performance this season. It started with his goal in the 57th minute and then something of an assist, as his through ball clipped Glen Johnson and silenced Anfield, making it 2-2. Brendan Rodgers finally made a change, throwing Joe Allen in instead of an injured Daniel Sturridge. Maybe it was forced, but it gave Liverpool the clam it needed to get back in the match. Mark Clattenburg made penalty mistakes – Liverpool deserved one after Luis Suarez was fouled by Kompany and Martin Skrtel touched the ball with his hand in the other box. Both times it wasn’t called. Everything came down to a huge mistake by Vincent Kompany with a failed clearance in the 78th minute, landing at Philippe Coutinho’s feet. Not the best finisher in the world, but something happened, and his curler was perfect, just where it should have been. 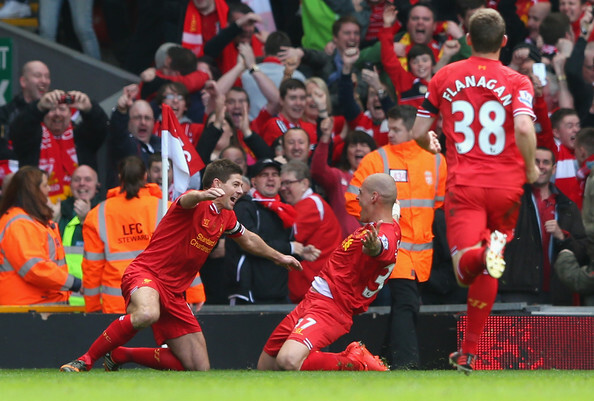 Liverpool defended well in the final minutes with 10 men, Jodran Henderson sent off. Now Liverpool are in control, but probably need to win the rest of the way in order to finish this season as unlikely champions.